I wrote the very first article ever published about Arn Menconi’s Snowboard Outreach Society (now SOS Outreach) back in the early 1990s when I was sports editor of the Vail Daily. That was long before his political career that’s now morphed into social activism of the highest level as he transitions from the helm of SOS to the full-time role of social justice activist. Say what you will about Arn — and many people have said many alternately laudatory and disparaging things about him over the years — he has never lacked passion and intensity. That was clear from that very first interview in the old Vail Daily offices above the Hubcap Brewery in Vail’s old Crossroads building. I remember coming away from that first meeting with Arn thinking, in typically cynical journalistic style, that he was a complete crackpot with a fantastically high-minded cause that would never fly. Skiers would always hate snowboarders and at-risk kids would never expand their horizons and achieve greater things through snow sports (a term that didn’t even exist back then). But 20 years later I’m happy to admit how wrong I was on both counts. Snowboarding is so mainstream it’s boring (even I’ve done it) and so many kids I’ve talked to over the years benefited hugely from SOS. Arn helped forge a generation of leaders in our industry and our community. Over the years I interviewed Arn many more times, closely following his political battles with fellow county commissioner Tom Stone for the Vail Trail and tapping him for profiles in ski magazines and in Denver’s 5280 Magazine. I also solicited his opinions on doping, cycling (another passion of his) and Lance Armstrong for The New York Times. As a proud liberal I also happen to agree with Arn — as do many Republicans — that our strategy of bombing ISIS into submission is wrongheaded and doomed to fail. In fact, there needs to be much more public outrage about our endless wars in Afghanistan and Iraq, and today’s youth need to lead that charge. If Arn can figure out how to make that happen, more power to him. June 3, 2004 — In both snowboarding and politics, Arn Menconi got a baptism by fire. “It was learning to swim by being thrown into the deep end,” he says of his first day on a board in 1991, when he mistakenly took the chairlift to the top of Beaver Creek then descended 2,000 brutally instructive feet. The founder of a feel-good nonprofit for at-risk youths called the Snowboard Outreach Society could easily say the same of his wide-eyed plunge into politics in 2000, when he ran for Eagle County commissioner as a liberal Democrat against a retired Republican businessman who lived in the up-scale gated community of Arrowhead. 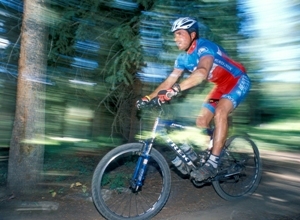 Arn Menconi mountain biking at Beaver Creek in 2004 (Dan Davis photo). “I came in with long hair thinking I would have it a little easier because I was running a charity and everyone knows I’m a sensitive guy who cares about people, and I immediately got a wonderful taste when my opponent wanted to sue because he said I ran a fraudulent campaign,” Menconi says. 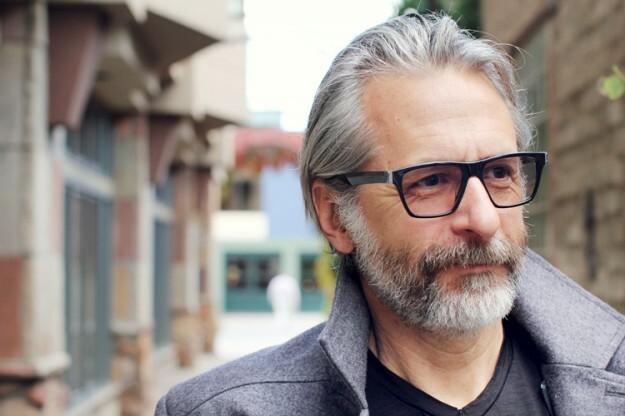 A wiry, athletic, Chicago native of Italian descent, Menconi says the mean streets of the Vail Valley are nothing compared to the Windy City’s South Side. But still, he bears the battle scars of 13 years as an avid snowboarder, mountain biker and populist politician fighting for the little guy in a cutthroat land of CEO second homeowners. “Everyone in the mountains is concerned about whether economic growth is going to mean the development of bigger homes and the squeezing out of the middle class. It doesn’t have to be that way,” says Menconi, who won that race by 39 votes and in the ensuing four years has battled tenaciously to preserve open space while building affordable housing in a county where the average single-family home costs $450,000 but per capita income is just $35,000. Besides running the largest competitive snowboard series in Colorado, Menconi’s SOS organization has introduced more than 8,000 inner-city kids to the sport at 25 ski areas nationwide. Now he wants to transform the Vail Valley into a summer adventure sports mecca to bring in the big bucks of wealthy weekend warriors training for their next endurance race. Menconi and the county in 2004 launched a Website called ecosports.com that maps the valley’s biking and hiking trails, kayak and rafting runs, and rock and ice climbing routes, as well as profiles local athletes like three-time Eco-Challenge champion and 2003 Adventure Sports Magazine athlete of the year Mike Kloser. Menconi’s athletically conservative by comparison, saying there’s no way he’ll go inverted as high or as long as snowboarders half his age, but he does like riding steep trees, and in the summer he’s consumed by endurance mountain bike races like the Ultra 100. Recreation as a political platform resonates with some voters, but in a county that’s predominantly Republican, where one real estate company peddled nearly a billion dollars in property last year, it rankles other sectors. Menconi’s opponent in 2000 accused him of importing snowboarders from nearby Summit County to cast bogus votes in Vail. “They actually believe that I organized a group of snowboarders to vote illegally and to that I usually say, ‘you better be careful … being an Italian from Chicago, I might have mob ties. I’m the Tony Soprano of nonprofits,” he says. After surviving a recount and threats of litigation from the Republicans, Menconi stepped in it again when he skipped a meeting where a boilerplate resolution condemning the terrorist attacks of 9/11 was approved. What troubled Menconi was language authorizing President Bush to use any means necessary to deal with the threat. Another commissioner, Republican realtor Tom Stone, made an issue of Menconi’s absence, and the local V.F.W. launched a recall campaign punctuated by heated rhetoric in the local papers. That effort fizzled when the vets failed to gather enough signatures. Menconi and his wife Anne have two children and live in the county seat of Eagle. He hopes for a world where his daughter won’t witness the racism or violence he saw growing up in Chicago in the early 70’s, or even the diluted discrimination of elderly skiers trying to ban snowboarding in Vail in the early 90’s. That treatment fueled his founding of SOS. Now he’s wielding SOS’s five core values of “courage, discipline, integrity, wisdom and compassion” in the political arena, calling for a code of ethics in the wake of a district attorney’s inquiry into Stone’s dealings with a development company on both a county project and a for-profit private transaction. Menconi accused his rival of conflict of interest, and Stone fired back that Menconi accepts charitable contributions from Vail Resorts and should abstain from voting on ski company projects.